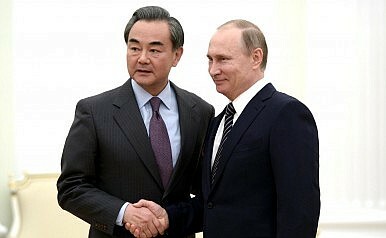 With China’s foreign minister in Russia, bilateral issues took a back seat to crises in the Korean Peninsula and Syria. Chinese Foreign Minister Wang Yi arrived in Russia on Thursday for a two-day visit. On Friday, he met with both his Russian counterpart, Sergei Lavrov, and Russian President Vladimir Putin. While the agenda was broad – encompassing the bilateral relationship as well as international issues – two particular topics were emphasized by both the Chinese and Russian Foreign Ministries: the Korean nuclear issue and the Syrian civil war. Wang’s trip to Russia comes at a particularly sensitive time for the Korean Peninsula. Last week, the United Nations Security Council passed new sanctions on North Korea in response to its nuclear and missile tests in January and February, respectively. North Korean leader Kim Jong-un, in turn, ordered all of the country’s nuclear weapons to be placed on standby. Meanwhile, South Korea and the United States are holding their largest-ever joint military drills, prompting test missile launches from North Korea. Russia and China have closely aligned positions on these events. Both countries are opposed to North Korea’s nuclear programs (and accordingly signed off on the UN sanctions), but also believe U.S. hostility toward Pyongyang is adding fuel to the fire. Accordingly, China and Russia alike see the U.S.-South Korea drills as a needless provocation, and aren’t much inclined to blame North Korea for the recent missile launches. And both China and Russia are firmly united in their opposition to the deployment of the U.S. Terminal High Altitude Area Defense (THAAD) system to South Korea. Though Seoul and Washington insist the missile defense system is intended only to defend against North Korea attacks, both Russia and China believe its radar capabilities pose direct threats to their security interests. Wang and Lavrov made their opposition to THAAD clear in their joint press conference on Friday. “The [THAAD] plans, which the U.S. has been nursing together with the Republic of Korea (South Korea), are in their scales above any possible threats which may come from the DPRK,” Lavrov said. Regardless of how they view THAAD and the U.S.-South Korea alliance, both Wang and Lavrov also emphasized that North Korea’s nuclear program was unacceptable. “We do not recognize the nuclear status of the DPRK,” Wang told reporters at the news briefing. Lavrov added, “It should be clear in Pyongyang that no one is going to exonerate the DPRK for such escapades.” Instead, they urged North Korea to return to negotiations on denuclearization. Given the unfolding situation on the Korean Peninsula, those issues occupied most of the headlines. But China and Russia included one more item on their agenda: the Syria issue. China has long been adamant that the crisis in Syria can only be solved through political negotiations, not military means – a position that applies to both U.S. and Russian airstrikes. Russia, meanwhile, has a vested interest in supporting the current government under Bashar al-Assad, which has close ties to Moscow. Elevating the Syria issue to the top of the China-Russia agenda signals how seriously both sides take the situation. China has largely stayed on the sidelines of the Syrian conflict — the current ceasefire, for example, was hammered out by Russia and the United States – but Beijing has become more vocal in recent weeks about its insistence on restarting political talks. Meanwhile, Putin, in his meeting with Wang, spoke of his “very warm and friendly business and personal relationship” with Chinese President Xi Jinping. Putin also noted that he plans to travel to China this summer. China appears ready to play a more active role in the Syrian peace process.